He's the greatest spy of the Victorian era, but he's met his match. Almost since birth, Modo has been rigorously schooled as a secret agent. His master, a British Lord, took advantage of Modo’s unique shape-shifting talents, training him to morph from his unsightly, hunchbacked-self into anyone he liked. When Modo is teamed up with the beautiful Octavia, his reasons for wanting to shape-shift become, well, more complicated. He never wants her to see his true appearance. Then urchins start disappearing from London streets, a high-ranking British Lord gets assassinated, and Modo comes face to face with a ruthless woman with a metal hand. It's clear that a deadly, secret organization has the British Empire in its sights. It will take every ounce of skill, guts, and luck for the pair to survive. Transforming his appearance and stealing documents from foreign embassies is all in a day’s work for young Modo, an elite British secret agent. A trickier task is figuring out his relationship with the beautiful Octavia, his fellow spy. Their latest mission - to discover why ships are mysteriously sinking in the Atlantic - seems impossible. There are rumors of a new and powerful underwater weapon - a submarine with a mad captain at the helm. The French are only a few clues away from finding it, so Modo and Octavia must get there first. But the ocean hides secrets much darker and more deadly than they’d ever imagined. 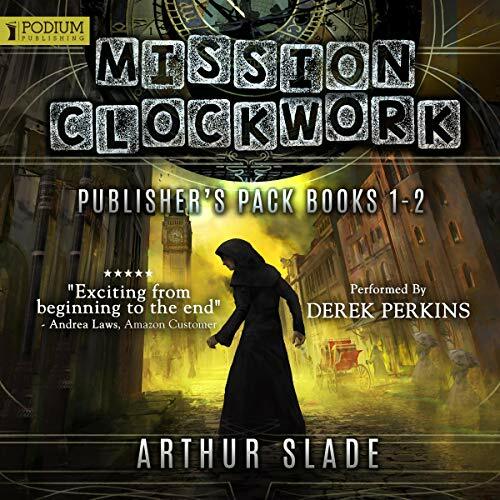 Mission Clockwork: Publisher's Pack is a gripping listen filled with treachery, suspense, brilliant heroes, and bloody brilliant villains. Spy Steampunk Thriller!!! Worth the Credit!!! With a average plot, and generic villains how is this book pack worth your precious credit? Modo. Despite how he calls himself a monster, he is incredibly human. While struggling with his deformity and the gift it presents, he has to grow up in the world of espionage. He is truly compelling along with his partner, Octavia. With them together any achievement feels really earned. Add the spy/steampunk elements and Derek Perkins excellent preformance to this story and you get an incredibly rich & adventurous experience. Please try this book! It's worth your time.